If you’re looking for the perfect gift for the karting enthusiast in your life this Christmas, then look no further as eKartingNews.com has you covered. Whether it’s a family member, friend, fellow karting fanatic or you are looking to treat yourself this holiday season, EKN has brand new items added to the karting apparel that anyone in the sport would love to find under the tree. Brand new to the EKN store are a trio of fantastic karting shirts, thanks to the hard working and artistic minds at Styled Aesthetic. The Wisconsin-based company, owned and operated by Steve Welk and Kyle Werra, has continued to grow since its inception in January 2009. Their portfolio includes a wide variety of clients and product, with a strong motorsports presence. No matter your needs, Styled Aesthetic can take care of you. With a truly classic look and feel, the EKN “Pinup” shirt is a favorite already. The “Pinup” shirt features a taste of the past and the present of karting while looking simple yet stylish. Sport this classic T everywhere from under your driving suit during a day of logging laps to underneath a sport coat with jeans at a dressy occasion. The EKN “Fix” shirt is as cool as it gets. The “Fix” T lets everyone know where you go to get your fix of karting news and information. It’s got a modern look and feel. Show your support of the leading media outlet in your favorite sport while showing support of for your favorite sport. Capping of the new line of apparel is EKN’s first long sleeve shirt. The “Skyline” design is one of the original designs created with the launch of EKN apparel line. The image of karts racing through a temporary circuit with the Vegas skyline in the background draws anyone’s attention and lets them know that you are serious about kart racing. 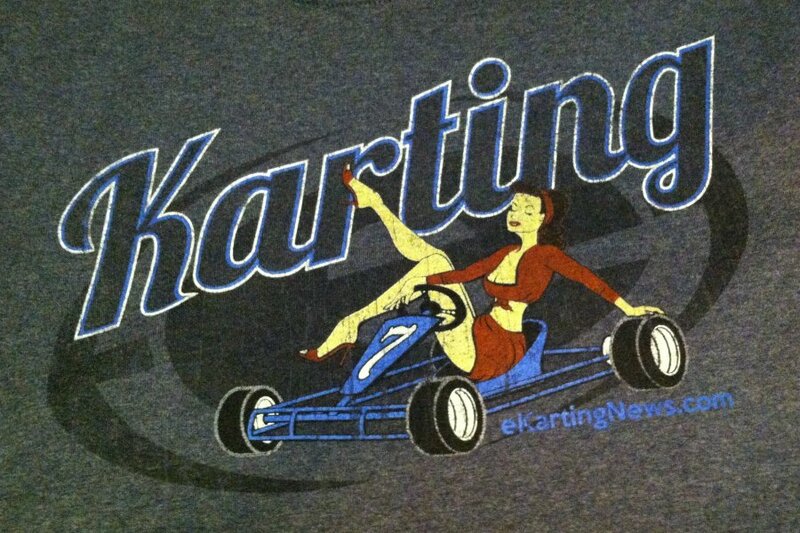 With both the “Pinup” and the “Fix” T-shirts coming in at $20 a piece and the “Skyline” shirt at $25, all three of the shirts make an affordable and very cool Christmas present for your favorite karter – even if your favorite karter is you. Head over to eKartingNews.com/store today to get your orders in to receive your EKN Gear before the Holiday season is over.